In this world of ever-growing technology, increasing numbers of Americans utilize some form of it in their everyday lives, whether it is to change the channels on their television sets with a remote control, do Internet searches from their computers, or send text messages from their cell phones. Many older adults have eagerly embraced every new type of technology that has come their way, while others have dug in their heels. Those who have been slow to embrace technology are often from our oldest generations. These folks were just retiring when computer technology was really taking off in the workforce. Today, there are very few offices, retail establishments, schools, libraries, etc. that don’t utilize some form of advanced technology. Computers, one popular form of technology, are now a common household item, with 3 out of every 4 Americans reporting that they own one. The number of older adults who are open to learning more about technology has been sufficient enough for the OCCOA to establish programs that will help older adults learn more about it. In 2008, the OCCOA, along with Michigan State University, the MSU Extension, and the University Center at Gaylord, partnered on some exciting new research, the Technology & Aging Program (TAP). The purpose of the research was to determine whether or not technology has the potential to empower older adults and improve their lives. The project (Tap1) was so popular with the older adults who participated in it, that a second phase of research (TAP2) was conducted, this time utilizing peer tutors (most of whom were the students in TAP1). After TAP2 ended, many of those students expressed the desire to continue learning more about technology, especially computer technology. The OCCOA was aware of the interest by older adults in learning more about technology, not only through the TAP project, but also through a 2009 Community Survey conducted by its research department. Almost a third (29%) of the respondents (age 60 or older) reported that they never used a computer, but almost a third (31%) of them said they would like to see the OCCOA offer computer classes to older adults. Since then, the agency continues to receive calls from older adults interested in learning about the basics of computers and the Internet. Increasing numbers want to know how to do Internet Searches, send emails, and establish accounts with such social media websites as Facebook. 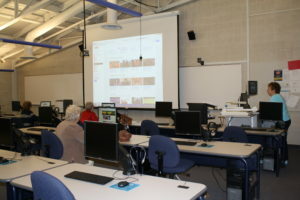 To answer the need for growing computer education in the older adult community, the OCCOA established a Computer Club in May 2011. The club began offering computer classes in the fall of 2011 to older adults who wanted to learn the basics about computers and the Internet, or to improve their skills. In early 2017, the club changed its name to Exploring the World of Technology. The group continues to offer monthly educational meetings on various technology topics. Meeting details are available on the OCCOA’s Exploring Technology web page, or by contacting OCCOA Healthy Aging Program Coordinator Amanda Dobrzelewski.